* Musical Audio Clip/"The Meaning of the 5%"
Is it a street gang of gun-runners, dope dealers, thieves and miscreants, or is it a youth group teaching Black pride to inner city youth? Is it an unofficial offshoot of the Nation of Islam, or a special forces Black Op? Is it a social group created to unify and spread the teachings of Islam to all those in need of knowledge, or simply a trendy cultural anachronism responsible for certain aspects of hip hop terminology? Much is said regarding the Five Percenters—a youth movement founded in Harlem in the mid-1960s. However, most of what is heard is uniformed opinion, speculation and rumor. 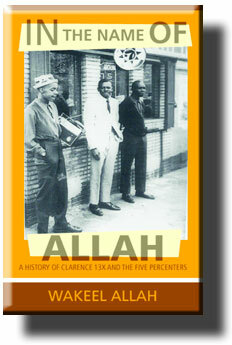 Wakeel Allah, an insider and scholar within the Five Percenters, has written the most thorough and comprehensive treatment of this story of Clarence 13X Smith (a.k.a. Allah, a.k.a. The Father) and the origin of the Five Percenters. At a total of 438 pages and with 432 reference notes, the book may appear somewhat intimidating, but it can be read and enjoyed no matter what level of previous knowledge exists in the reader's mind regarding the subject. It is important to understand that like most movements that have become national, and even global in their impact and reach, the Five Percenters are not necessarily monolithic in their views and belief systems, or in total agreement regarding what the group is or represents. The author delves deeply into the intricacies and subtle variances of the different schools of thought without being disrespectful to any, through forthright and effective dissection of the ideological differences that exist within the group.